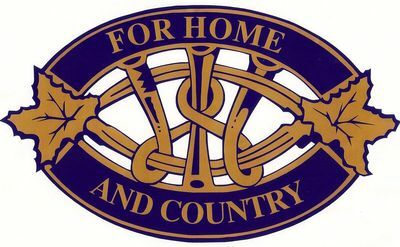 As early as 1927 the Reid’s Corners branch of FWIO was encouraging the Township of Huron to erect a new hall in their community. When no action had been taken due to the intervention of the Depression and WWII, the members decided in May 1947 to take matters into their own hands. With the help of a collection taken in the neighbourhood, they bought a lot for $50 and undertook to have a hall built. The work of building began almost immediately and payments were made for materials and lumber. Fund-raising continued, a bank loan was taken out and a grant from the Provincial Government was secured. Thanks to these initiatives and a good deal of gratis labour, the Reid’s Corners Community Hall was in use by April of 1948. The Hall became a popular location for meetings, banquets, dances, wedding receptions, theatrical presentations and short courses all of which contributed to the upkeep of the building. In the attached picture it appears somewhat worn. Usage declined as needs changed and the hall passed into private hands. It now houses a fascinating collection of memorabilia as Reid’s Corners Antiques. 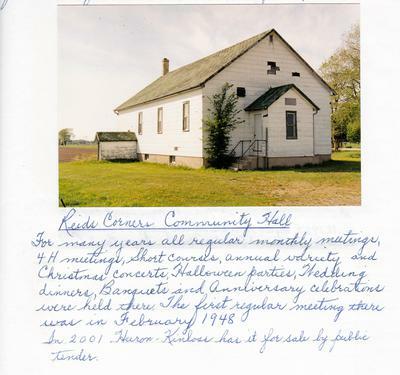 For many years all regular monthly meetings, 4H meetings, short courses, annual variety and Christmas concerts, Halloween parties, Wedding dinners, Banquets, and Anniversary celebrations were held there. The first regular meeting there was in February 1948. In 2001 Huron-Kinloss has it for sale by public tender."